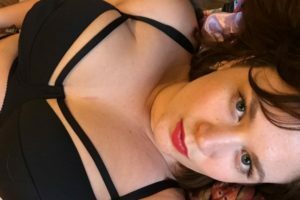 Thank you to Le Curvy Kitten for the following review of Louise cage bra in black. Back in summer last year, Katy of Katherine Hamilton contacted me asking if I’d like to review a set. Naturally I said yes as I’d had my eye on the Louise set for a while. Due to production issues, the launch of the set was put back until December which was when I received my set. I thought the week before Christmas was a little too late to blog about a potential Christmas gift so here we are, ready for Valentine’s Day instead! Katherine Hamilton is a new brand in the high end of the fuller bust market. Boasting luxury fabrics, custom underwires, attention to fit under the arms and most importantly research into common issues in fit, I’m looking forward to seeing how this more customer fit focused brand grows. Originally from a background in psychology and mental health, Katy found her passion for lingerie working for Bosom Galore, another luxury fuller bust brand. Following this, she developed her own designs based on customer feedback and issues concerning ‘off the rack’ underwires. After research she was able to create 2 core designs; 3 piece padded and 3-piece unpadded, using her bespoke narrow underwires and deeper cups designed for full coverage and support. For me personally, the fact that Katy researched the fit of large cups with small bands was a winner, as a lot of brands simply size down the bands without altering the wires used, meaning I often have problems with wires sitting in and sometimes behind my armpit! Louise knicker I chose obviously matches the bra perfectly with its strappy detailing and soft black fabric. The set arrived wrapped in black tissue paper, beautifully packaged in a branded box with paperwork in an envelope, giving a real sense of luxury. I was advised to try the 30H as their bands are quite snug, but on arrival, I found it was too big so I exchanged for the 28H, which is a perfect fit. The knickers are a size 14 and fit me beautifully. It isn’t often I’ll find a new brand that gets the fit of a bra spot on for me, but the Louise is perfect. I tend to wear a Curvy Kate Smoothie on a daily basis nowadays since I outgrew my all-time favourite Freya Deco, but I can confidently say that my Louise bra fits well enough for me to add to my daily collection with a fit not dissimilar to the aforementioned Curvy Kate Smoothie. The fabric is so soft and comfortable against the skin and it….it just fits! I feel I should rave about the fabric. According to the website, the Louise set is made from Charmeuse, a 85% Polyamide and 15% elastane mix, which feels lovely to wear. I have a few minor criticisms with this bra (none with the knickers, I LOVE them!) and they are that I’d have preferred a fully adjustable strap as I’m of quite a petite build so this is often an issue I have. Thankfully Katy informs me that they will be introducing a custom service for strap length soon. My other small gripe is that there seems to be something making me itch in the hook/eye panel to the back of the bra. I can’t for the life of me figure out what it is, but it’s mildly annoying all the same! Lastly, I’d have preferred the harness type straps to come from the top of the central gore rather than the sides, but I suspect this is more about my own breast fullness (or lack thereof), rather than the bra itself. Our strap amendment service will be online within the month and in the meantime, customers can contact us to request a strap amendment. With regards to the niggly hook and eye issue, this may be due to how the edges are sealed to prevent fraying, which can result in a few teeny hard bits. Although small, we understand that any slight hard bits in intimates can be bothersome when pressed against soft skin for long periods of time and so for all future production we are using some new hook and eyes that we have just developed; they will be sealed using a different technique to ensure super soft edges and, following a request made by a customer a few weeks back, they will also have a longer strip of padding for extended protection from the hooks. In the meantime, if you feel along the edges and find any hard bits, we recommend gently trimming them, ensuring not to risk any fraying.